My hungry teenagers will be home in less than 15 minutes from school. I am sure they will be starving with tons of homework to do. I have a snack plan and easy appetizer that will knock your socks off. My dear friend Yoonsun showed me how to make these simple yummy filling Korean snacks that I am sure everyone in your family will enjoy. Today we are going to use these long tubular rice cakes (found in the refrigerator section of Asian grocery store) which are the same type of rice cakes that are used to make the spicy yummy famous dduk bok ki. When you bake Korean rice cakes, they becomes slightly crispy on the outside and chewy and warm on the inside. The laver (nori) seaweed leaves are slightly salty and crispy and the dipping sauce is a simple soy and brown sugar combination. 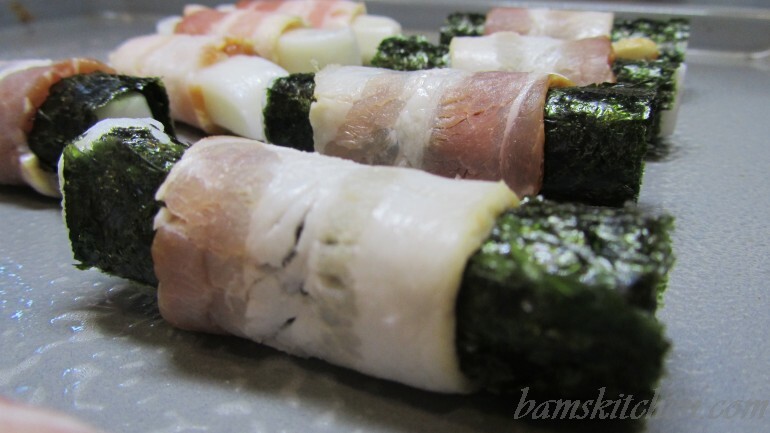 You can even add bacon wrapped around the rice cake to give it extra protein and flavor that almost every teenager enjoys. When all the flavors of the sweet and salty combine and the crispy and chewy it creates something quite heavenly and magical in less than 15 minutes flat! What is a rice cake? A rice cake may be any kind of food item made from rice that has been shaped, condensed, or otherwise combined into a single object. A wide variety of rice cakes exist in many different cultures in which rice is eaten, and are particularly prevalent in Asia. For example, In Japan they call rice cakes mochi and in China they call rice cakes nian gao. 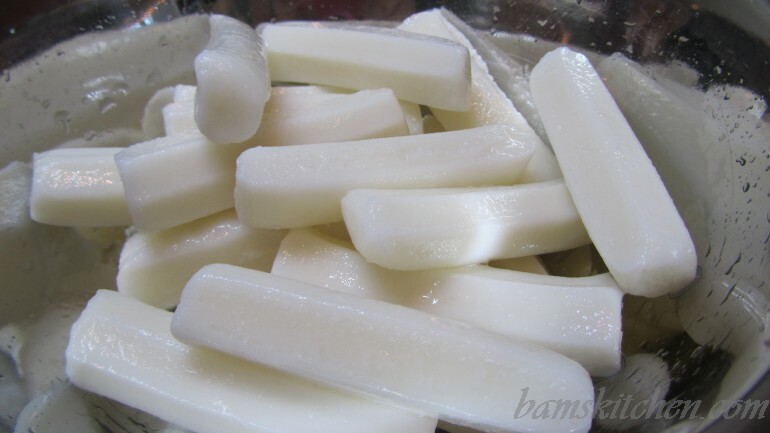 Rice cakes come in long tubes, round thin disks, squares and many other shapes. So the beauty of this dish is you do not have to use the long tubes but can use any rice cake you can find and shapes that you enjoy. What is laver? Nori? Gim? Laver is an edible, littoral alga (seaweed), and has a high content of dietary minerals, particularly iodine and iron. 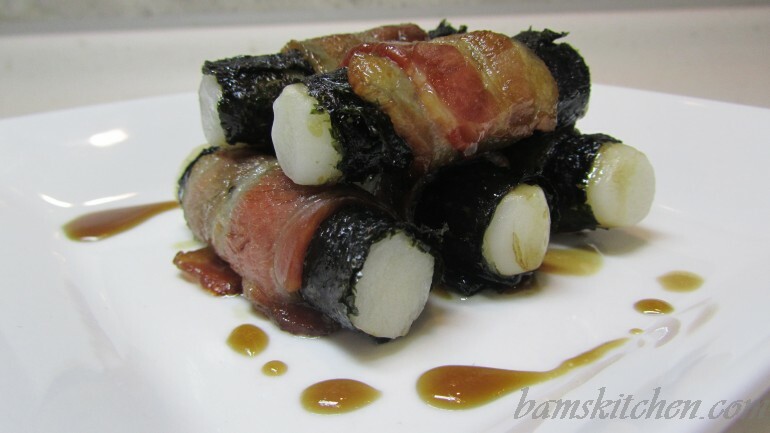 Laver is widely consumed in East Asia, where it is known as zicai in China, nori in Japan, and gim in Korea. My boys love laver and eat it by the packets full in school lunches. Their favorite laver flavor is olive oil. Step 3: Spray your cooking pan with a light layer of cooking oil. Step 5: Mix together in a small bowl your soy sauce or soy sauce alternative and brown sugar or sugar alternative. Stir until well mixed. 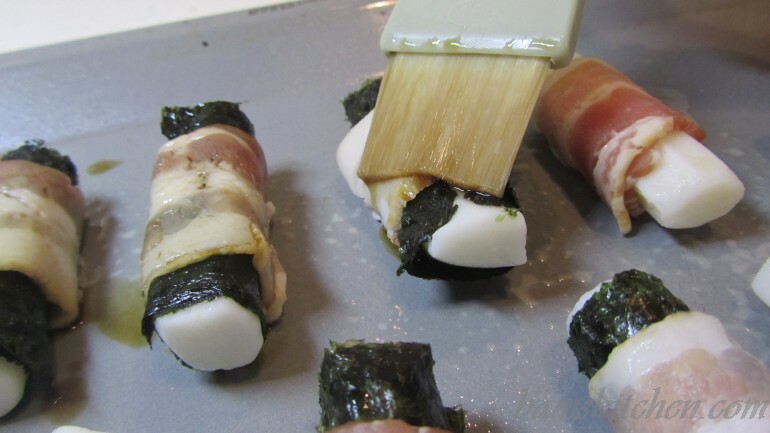 Step 6: Brush a moderate amount of the soy sauce mixture on the Dduk lavered in bacon. 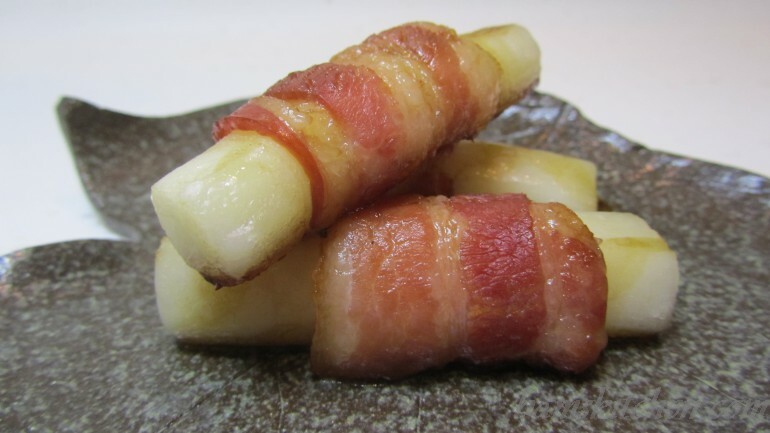 Step 7: Place the Dduk lavered in bacon in the oven and bake for about 15 minutes until the bacon is crispy and the rice cake is chewy on the inside and slightly golden on the outside. Reapply and brush the soy sauce mixture a couple of times during the baking process. Step 8: Serve yummy Baked Dduk Lavered with Bacon as a yummy after school snack or a yummy hot appetizer at your next social gathering. Best served hot out of the oven.